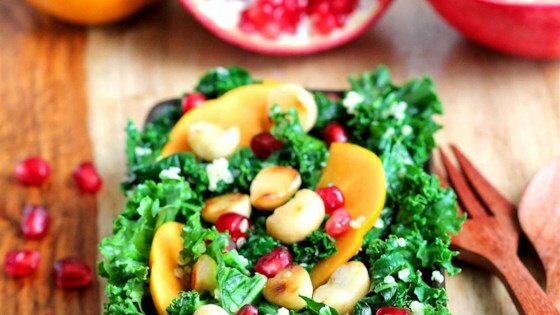 "A beautiful winter celebration salad to kick off a happy and super healthy holiday season! Add cooked quinoa if desired." Toss macademia nuts with 1 tablespoon maple syrup and pinch of salt; spread on baking sheet. Toast macademia nuts in the preheated oven until lightly golden, about 5 minutes. Remove from oven and coat with 1 tablespoon maple syrup. Whisk orange juice, lemon juice, 1 tablespoon maple syrup, and ground black pepper together in a small bowl to make dressing. Place kale pieces, 1 tablespoon olive oil, and 1/2 teaspoon salt in a large bowl; massage with your hands until kale is tender, 3 to 5 minutes. Add persimmon slices and dressing and toss to mix. Top with pomegranate seeds and maple-roasted macademia nuts.